A day on Belle-Ile-en-Mer: what you must see! 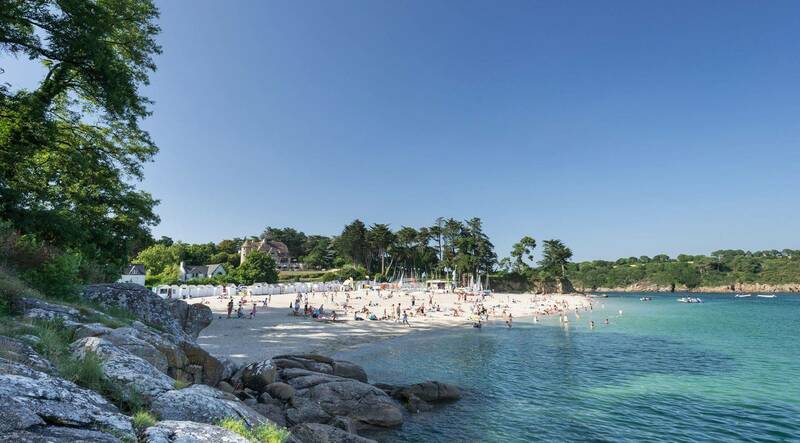 Take advantage of your camping holidays in the Gulf of Morbihan to escape to the most beautiful and largest of the Breton islands! Belle-Ile is a must-see destination in Southern Brittany and the Gulf of Morbihan and is full of wonderful treasures to discover. Magnificent landscapes, gentle and relaxing atmospheres, remarkable historical monuments, Belle-Ile-en-Mer, the well named, is a concentration of nature and culture that holds many surprises for budding adventurers, sports enthusiasts, hikers and other outdoor enthusiasts. 20 km long and 9 km wide (84 km2), Belle-Ile-en-Mer is located 15 km off the Quiberon peninsula and the entrance to the Gulf of Morbihan. A little over 5,300 people live year round in Le Palais, a fishing, commercial and pleasure port, but also the capital of Belle-Ile; Sauzon, a picturesque little port nestled in the north-west; Bangor, nestled in the heart of the island countryside in the interior; and finally Locmaria, the southernmost village in Brittany, located at the eastern tip of the island. Belle-Ile is full of heritage treasures and more or less hidden natural sites to discover. Among the must-see attractions is the Vauban citadel, which dominates the harbor of Le Palais. Built in the 11th century and then redesigned by Vauban from 1683 to make it "one of the best squares in the kingdom" with its weapons square and arsenal, its curtains, casemates and powder magazines. Open to visitors, the citadel also houses a museum dedicated to the history of Belle-Ile. At the far north of Belle-Île, Fort Sarah Bernhardt is a 19th century military fort. It owes its name to the famous French actress who spent her summers there for 30 years, carrying pets, parrots, chameleons and even a crocodile and a boa in her suitcases! Left abandoned for many years, the fort and the two villas were restored in the 2000s and transformed into a museum dedicated to the life of the illustrious tragedian. A little further on, linger on the Pointe des Poulains, a magical place, not to say paradise! On a clear day, you can see the island of Groix, Lorient and the Bay of Quiberon. Immortalized many times by the painter Claude Monet, the needles of Port Coton are among the emblematic places of Belle-Ile. Composing a wild and grandiose landscape in the commune of Bangor, these immense steep cliffs beaten by winds and waves still fascinate photographers and walkers in search of sensations. Don't forget your camera or brushes! Dominating the site of the Port Coton needles, it is one of the most powerful lighthouses in Europe! Inaugurated on January 1, 1836, the Grand Phare de Belle-Ile rises 52 metres above the cow floor. If you feel up to the 247 steps that lead to the top of this granite tower, you will be rewarded with a unique view of the wild coast of Belle-Île. On the ground floor, an exhibition will tell you more about the history of the lighthouse and the daily life of the four keepers who occupy the site. Belle-Ile is a promised land for campers who enjoy hiking and cycling. Let yourself be surprised by the diversity of landscapes and atmospheres: wild coast, moors, steep cliffs, secret coves, sea caves, small quiet rias... With nearly a hundred kilometres of hiking trails and tens of kilometres of cycle paths, Belle-Ile-en-Mer is a real paradise for hikers and cyclists in search of discoveries. How to get to Belle-Ile? Several shipping companies operate services from Quiberon, Vannes, Locmariaquer and Port Navalo. From Quiberon, the Compagnie Océane offers the possibility to board with your vehicle or bike. Other airlines do not offer this option (passengers only). However, you can rent a bicycle, scooter or car as soon as you arrive on the island. Where to find the ideal campsite? Have you been given the desire to spend a wonderful day on Belle-Ile during your stay in Morbihan? Here are our favourites to find the perfect accommodation for your camping holiday near Belle-Ile-en-Mer!